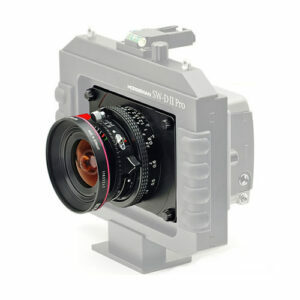 Lens Description: The Horseman 55mm f/4.5 Apo-Sironar digital Lens Unit for SW-D II Pro is a Rodenstock 55mm Apo-Sironar digital with a standard Copal #0 shutter, but built into a Horseman-specific helical focusing mount and barrel assembly made to fit upon their SW-DII Pro camera. This lens provides a standard angle of view (equivalent to a 40mm lens upon a 35mm camera when used with a 36 x 48mm sensor), and its large image circle allows the full range of body movements available upon the SW-D II Pro. Distortion is negligible, and spatial relationships of objects captured in a scene will appear realistic.